Home » Blog » Learn » Google Tilt Brush Is So Cool! Google Tilt Brush Is So Cool! Can you even fathom how amazing it would be to be able to to take your artwork off the page and turn it into room-scale 3D masterpieces? Visual art has just gotten really interesting, thanks to some innovative minds and Google. Google Tilt Brush is an innovative application which lets you create 3D paintings, drawings, and sculptures using the magic of virtual reality. You can make any room your canvas and create works of art, not only with color but also special effects like fire, light, and stars. All you need is Oculus Rift with touch controls or an HTC Vive, and the visions in your head can now be a reality. It all began in San Francisco when veteran video game developers and VR enthusiasts Patrick Hackett and Drew Skillman were attempting to create a 3-D chess application. What they noticed was, as the chess pieces were moved through virtual space, they left behind colorful trails of light. They decided to make the most out of this unexpected effect and shelved the chess game. Instead, they developed a 3-dimensional drawing tool. Seven months later, in April 2005, Google purchased Hackett and Skillman’s prototype Tilt Brush and their company. The app got its name because, in early versions, users could paint on a 2D surface which could then be tilted in any direction in VR space. With the help of Google and a team of expert developers, Tilt Brush is now a much more sophisticated tool that can be used not only for drawing and painting but also sculpting in a 3D space. Google Tilt Brush is very user-friendly. One of your controllers will serve as your artist’s palette, providing you with a wide range of colors and special effects, while the other can be used as a brush or pen. Your headset will allow you to see the image you’re creating as though it is suspended in mid air right in front of you, in three stunning dimensions. You can walk around your work of art, step through it, and even put your head inside it. Dynamic brushes: You can paint just about anything in your 3D space, from snow to stars. Picking colors is simple, and there is a range of designer strokes to choose from, such as rainbow, thick paint, and hyper color. User-friendly interface: The user interface is intuitive. Features are arranged in a menu and items are easily accessible with a simple swipe. Walk through your art: Like all the fun things in a VR environment, you can immerse yourself in your Tilt Brush artwork. You can literally walk through your paintings and see them as virtual color strokes all around you. 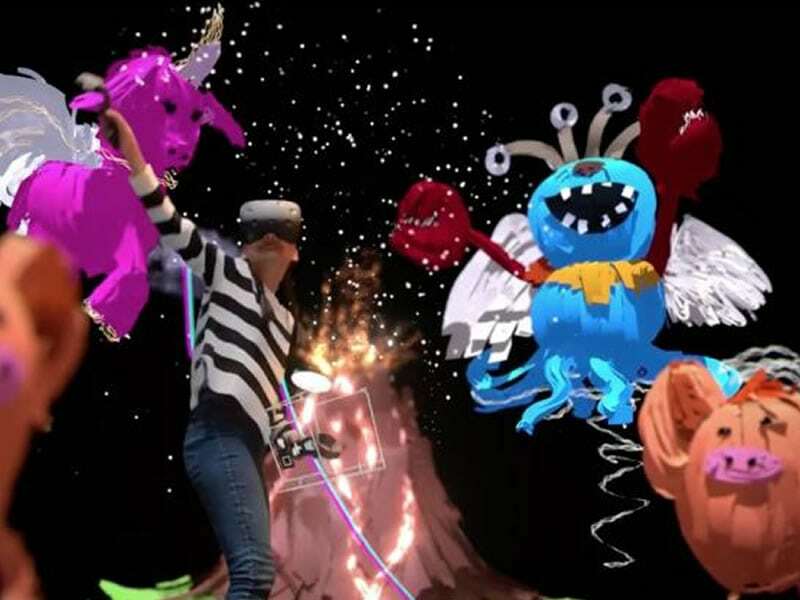 Share your vision: Google Tilt Brush has built-in options that allow you to share your 3D creations with others. You can share them as animated GIFs or room-sized VR ready masterpieces. Making artistic creations in the virtual world is very different than using any other medium, mainly because you are completely immersed in the artwork. In a way, you are creating a whole new world which you can move around in. This is one of the reasons Tilt Brush is becoming so popular with installation artists. However, it’s also a great tool for fashion designers, who can use it to create clothes using textured paints like cotton, denim, and silk. Another great feature is how you can easily adjust the size of your art, so you can take your room-sized painting of a monster and reduce it to the size of a GIF. When you’ve completed your latest masterpiece, you may not be able to hang it on the wall, but you can share it. Several sharing platforms are available, some of which allow you to experience the works of art in the virtual, while others enable you to embed and share your work. Google’s site Poly is a space where you can post your 3D art and interact with it by zooming in and out or changing the angle. You can also see other peoples’ creations, and use other peoples’ VR artwork in your own creations if they have been made available. While sharing your VR artwork as an embedded image or video is cool, sharing it in social VR is even more fun and takes it to a whole new level because others can immerse themselves in your creations too. High Fidelity VR is a social virtual reality platform where users can create virtual worlds, share them, and interact together within them. It’s a great place to set up your own virtual art gallery. The presentation reveals a completely novel way to draw, sculpt and paint. Each of the artist’s creative sessions has been recorded and can be viewed online so you can see first hand how they develop their individual VR works of art from multiple angles. Is Google Tilt Brush changing the future of art? It certainly offers a degree of artistic freedom which is unprecedented, and the ability to create artworks, whether sculpture, paintings or whole installations, from the ground up. If this medium does become the favorite of the artists of today and tomorrow, it could also reinvent the way art is exhibited and experienced. Google Tilt Brush comes free with the purchase of the HTC Vive, or it can be bought separately on Steam. If you’re looking for a similar alternative to Google Tilt Brush, check out Oculus Medium and Quill by Story Studio.